This photo was taken at Coomalie Creek in 1943. It shows personnel of No 1 PRU loading film magazines into an unidentified F-4. 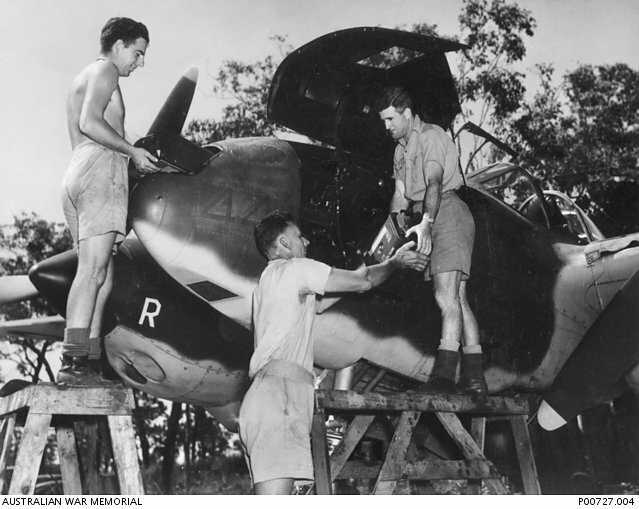 Given that the aeroplane is with 1PRU and has been resprayed in RAAF camouflage (as opposed to Haze Paint) the aircraft can be only A55-1, A55-2 or A55-3. A55-2 can be eliminated as it crashed in 1942. A55-3 was delivered to 1PRU in March 1943 and A55-1 was still in service at this time. Although otherwise unidentified, the aircraft depicted carries the number "44" in low contrast paint on the nose. Latest research suggests that the former identity of A55-3 was actually 41-2144 and not 41-2122 as stated in most references. Given the presence of the number "44" on this aircraft it is, in all probability, A55-3.